Sales is less about having the right opportunities and more about handling those opportunities right. That’s why empowering your sales team to fully grasp and excel at the entire communication equation is so advantageous for their productivity, morale, and ability to accelerate your company’s financial goals. In fact, research reveals that high-performing sales organizations are twice as likely to offer supportive sales training than their low-performing competitors. One such training taking hold in sales is called “Listening Intelligence.” This training method helps your sales teams identify the way each individual client filters, analyzes, and interprets the information they hear. This allows sales professionals to speak into the listening preferences of their clients to more effectively communicate the value of their offering. Additionally, nearly 70% of buyers say that agents who listen to their needs create the most positive sales experiences, and that’s why learning the ways in which people listen can exponentially grow your sales teams’ conversion rates and lifetime values. Since listening is half the communication equation, having access to the ECHO Listening Profile, the first cognitive-based listening assessment, ensures that your teams have a cutting-edge understanding of customer communications to help reach their goals. Let’s take a look at how listening can change the way you approach sales. As explained in a previous blog, our style of listening is a habit, rather than a hard-wired trait. 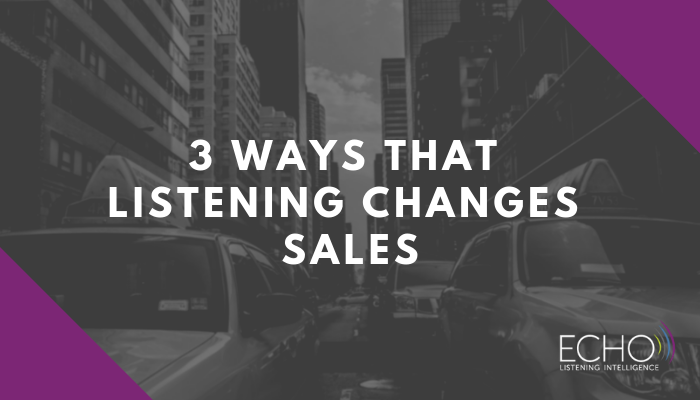 But teaching your teams to understand the four main listening habits can provide them a significant ‘leg up’ in connecting with prospects and engaging in a smooth and successful sales process. While everyone uses all four types of listening to varying degrees, most people tend to rely on a preferred or “dominant” style. By contrast, highly Reflective listeners will filter communication mainly through their own interests and purposes. They want to know what this purchase will mean for them and will tend to carefully consider information against their own knowledge and experience. You can often recognize Reflective Listeners by a more reserved or “held-back” demeanor than the Connective Listeners described above. They tend to consider very carefully everything being said, and may not say very much, which can convey the false impression of being disconnected. In reality, they’re actively asking themselves things like, how will this affect my budget? Will this land just as flatly as the product we tried to incorporate last year? If I become an advocate for this, and it benefits the company, might that lead to a promotion? After processing this all internally, they will then ‘reconnect’ to share their ideas or questions, which are often quite thoroughly considered by that point. Conceptual listeners, tend to focus on ‘big picture’ ideas and possibilities. Entrepreneurs and creative marketers often demonstrate this type of listening, and they are apt to get excited about how your product can help shape their organization’s future. You can often recognize Conceptual Listeners by their readiness to ideate about and explore any unique and far-reaching qualities your product brings to the table. Even if they don’t see a fit for themselves as a buyer, they may just continue on ideating for your benefit, suggesting ways you might improve your product or certain applications you hadn’t thought of. Conceptual listeners tend to do this with ease, as they experience ideation as an enjoyable end-in-itself. Over a quarter of those surveyed describe qualifying a lead as the most difficult part of the sales process. Having a firm grasp of your lead’s listening style can help you assess which advantages to emphasize in order to make them inclined to want to move from a lead to a viable prospect. If you’re not speaking their listening language, both parties may miss the fact that what you have to offer is actually a great match for their current or future goals. In this way, being attentive to your lead’s listening style is a great way to unearth relevant selling points, but from their unique perspective. By determining their listening habits you can begin to predict whether they’d rather focus on bottom line financial savings, workflow support, everyday applications unique to their role, or innovative design features that can bring a positive spark of renewed energy to their organization. You can then begin to establish a connection that allows the sales process to proceed forward in a manner that ensures empowered and informed decisions. If you know you’re speaking with a conceptual listener, for instance, you can put your attention on the possibilities your product opens up for their organization’s new growth goals. This type of listener might also appreciate suggestions that embrace ideation, such as forming ‘test groups’ within their organization to brainstorm how integration would benefit each department. By contrast, a reflective listener may be more interested in how your offering advances their specific role in ways that helps them deliver stellar results. These contrasting needs can be better addressed once you understand the main objective of each type of listener. When you send out emails, it’s good to include information not only about your product features and benefits, but to make sure you are implicitly addressing the concerns of each of the four listening styles. You can then go on to ask which of these interactive benefits most resonates with your readers. This is a way to begin the process of determining which listening style each of your leads prefers, while at the same time increasing your chances of receiving a response. Utilizing this strategy helps ensure timely, well-informed, and optimized communications from the very start. By providing communication options that encompass all four styles, you’re showing your prospects your willingness to support and understand them, even before you’ve formally presented your products or services. This focus on their preferences highlights that you’re not just selling them merchandise or ideas; you’re also determined to serve their unique needs. As we’ve seen, data-driven Analytical listeners will bring a whole different set of questions and concerns to the table than ‘big picture’ Conceptual listeners, and the same holds true for Connective and Reflective listeners. Paying attention to the trends in prospects’ conversations provides valuable insight into how they navigate the world. Once you are able to connect virtually or in-person, body language cues can also play a big role. Observing whether someone is warm and physically connective or appearing distant and ‘in their own head’ for instance, can help you quickly identify the type of information they are listening for. Companies that are ranked high in effective communication are three and a half times more likely to financially outperform their industry peers. Contact us to find out how we can help your sales teams gain a deeper understanding of Listening Intelligence through our innovative cognitive assessment, custom-tailored profiles, and one-of-a-kind Certified Practitioner Training Program. We’ll assist you in building better customer relationships through enriched communication and collaboration that leads to higher-yield deals and accelerated company growth.